In simple terms, obesity is an excess of fats in a body. In scientific terms, Obesity is a medical condition that occurs when a person carries excess weight or body fat that might affect his health. A doctor will usually suggest that a person has obesity if he has a high body mass index. An obese body is like an invitation to diseases such as diabetes, hypertension, heart disease, and many other ailments or imbalances that may grow in the body. Furthermore, psychological imbalances and complexes also arise due to obesity making life less enjoyable. The accumulation of fats does not take place on the exterior body alone, but the fatty tissue also gets deposited around the internal organs and spaces in between the muscles. Vital organs like the heart, liver, kidneys get surrounded by fat tissues, resulting in extra work to be done by these organs. It becomes more difficult for such bodies to be fully active. If we are able to keep fit and avoid excess weight gain i.e. obesity, we can avoid the risk of developing many physical and mental disorders. The main cause of obesity or the weight gain is the modern day lifestyle. The technology, the comforts that have come through technology, and the resulting sedentary lifestyle, is the main reason behind the weight gain or obesity. A healthy person of normal weight takes a diet to keep himself fit and energized. The energy which he gets from the diet is consumed in his daily activities. Since all the energy released is consumed, no energy is stored or left behind in the form of fat tissue. But if the same person put on weight, it means that there has been a change in his lifestyle which has resulted in storing energy in the form of fat tissue. The reasons can be that either he has changed from an active lifestyle to a more sedentary lifestyle. There can be a change in one’s eating patterns. Changes in eating pattern or diet can again mean an increased consumption of fats, sugars, processed food and other foodstuffs that result in obesity. Other lifestyle changes may come to one’s life if he falls ill or meets with an accident resulting in reduced activity. The activities of such a person get reduced but he continues eating as if he is as healthy and active as he was before the incident. This all result in storage of extra energy in the form of fat tissues in the body. When we talk of obesity or yoga and weight loss, we refer not only reducing excess fats deposited on the physical body, but also other aspects of our being and the way in which we nourish and mobilize those aspects. It is not enough to change the diet plans or changes the lifestyle, but also to work on the level of consciousness, and on the other aspects which are instrumental to mental energy. 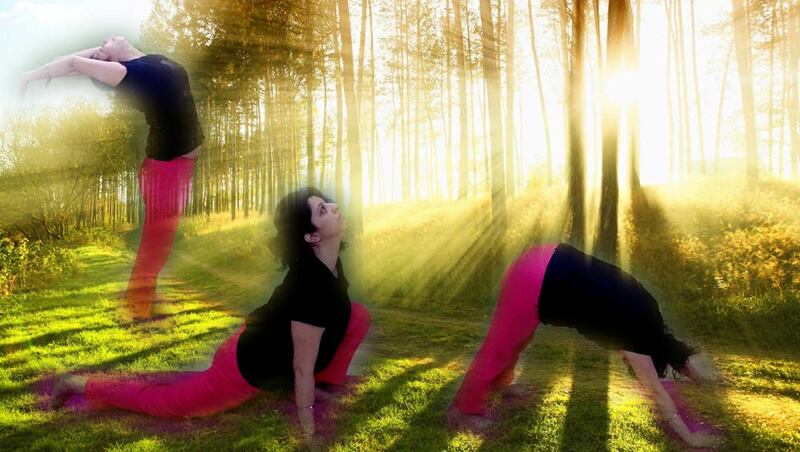 Yoga is a science of developing our body/mind instrument for the expression of consciousness. In yoga therapy, the purpose of Yogic kriyas is not only to burn extra calories but to develop body awareness, stimulate energy centers and express consciousness. So the aim of Yogic Kriyas written below is not just the reduction of weight (as explained above), but this is bound to happen as an outcome of increased self-awareness. The best asanas for obesity are the abdominal/digestive group of asanas which help to remove extra fat from the abdomen, hips, and thighs, and activate the energy in the lower pranic centers. Dwi Pada Uttanpadasna is one of the best Yoga poses for weight loss, especially the lower abdominal area fat. It helps to burn the fat of lower belly region. Its regular practice of this asana will help to strengthen the lower back muscles, pelvic muscles, and perineal muscles. Dronasana develops a great pressure and tenses the whole body particularly the abdomen. The abdomen is softened and its tightness removed. Excess fats are removed from the abdomen and lower back areas. Boat Pose Yoga is very good asana for body weight loss. You can also practice Pada Chakrasana (leg rotation), Pada Sanchalanasana (cycling), Pawanmuktasana (wind release pose) apart from these two above stated Yoga Poses. Chakki Chalanasana or Churning the mill pose helps in getting rid of excess fats from the belly when practiced regularly and is one of the best yoga poses for weight loss. Nauka Sanchalanasana is another asana of shakti bandha asana group which helps in getting rid of excess fats from the belly, pelvis, buttocks & thighs. Its complete detail can be read in the concerned post. 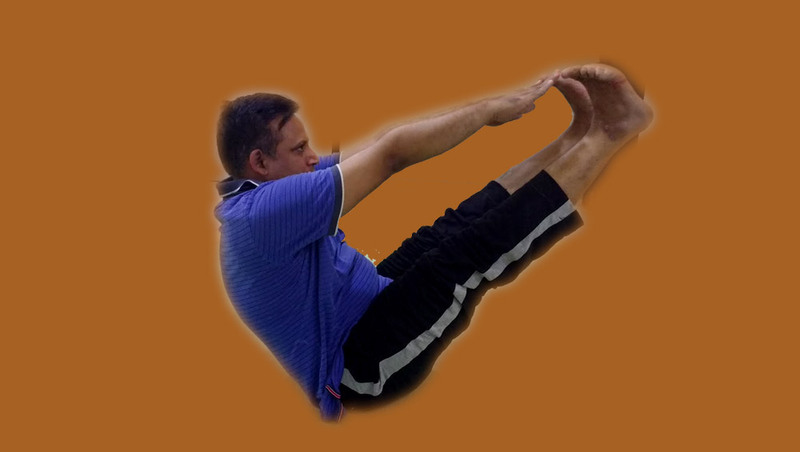 Gatyatmak Meru Vakrasana (dynamic spinal twist), another asana of the Shakti bandha series group which can be practised for dealing with obesity. Surya Namaskar or the Salutation to the Sun, constitute the most important set of Asanas for the treatment of obesity. Surya Namaskar in itself is a complete practice, as it includes asana, pranayama, mantra, and meditation. This practice influences the endocrine and nervous system, helping to correct metabolic imbalances that cause and perpetuate obesity. The pranayama practices for obesity are of a dynamic form that stimulates the metabolism. The best of pranayama for obesity is Bhastrika Pranayama. Bhastrika Pranayama, also known as ‘Bellows Breath’ massages and stimulates all abdominal organs and removes the excess fats from the belly. 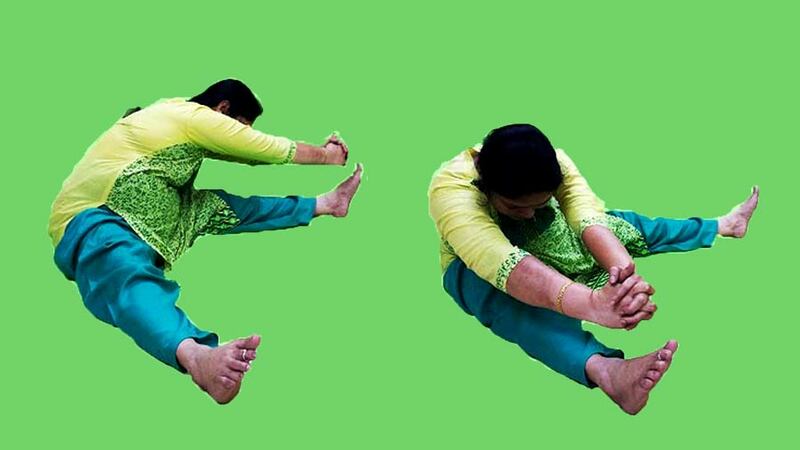 How to do the Bhastrika and what are its benefits, contraindications can be read in the post How to do Bhastrika Pranayama (Yoga Breath of Fire) – Steps, Benefits & Contraindications. Shatkarma practices clean body internally and keeps it free from pollutants. They balance bodily rhythms at a subtle level. The Shatkarmas also help to balance our emotions and produce a feeling of lightness in the body. After practicing Shatkarma, one feels as if the body/mind system has got rid of extra weight, both physically and mentally. Meditation helps clean mind of extra weight in the form of toxic thoughts that tend to be self-perpetuating. These thoughts manifest physically in the form of a lack of activity or passivity and poor food habits which ultimately leads to obesity. In yoga, the Yogic Kriyas will work wonder when one is aware of what he is doing and has faith in what he is doing. The real therapy begins with self-awareness. Then only can he make the necessary changes in his lifestyle and give it a new direction. Then only he will realize what his body/mind system requires in order to develop a sense of balance. The changes in behavior, habits, and lifestyle, can only be maintained if they are supported by the realization of what the real needs, strengths, and weaknesses are. This will further help to develop a greater sense of self-confidence, and the changes thus implemented will last lifelong. Hi… Do you have any techniques from YOGA for stammring. Normally while talking to boss in office or facing a large audience, then stammring started. Please suggest how to control this behaviour ?? Dear Mr. Sanjay, thanks for having gone through the site and raised the query, a valid one. Yes in general Kapal Bhati, Anulom Vilom Pranayama, Ujjayi, and Bhramari are going to help you as all these breathing exercises affect the brain in different ways developing self-confidence, concentration, focus, calmness, and peace. To be specific, Simh Mudra and Simh Garjanasana are two kriyas, which can be regarded the best kriyas for stammering.